For years friends have told me about how different literary life is on the continent: reviews less suspicious and less petty than they are here, audiences more interested in the books than the author's celebrity, more interested in discussing ideas than suppressing them, and the culture generally more receptive to new writing rather than the hollow echoes of epigones. Well, now I have direct experience. 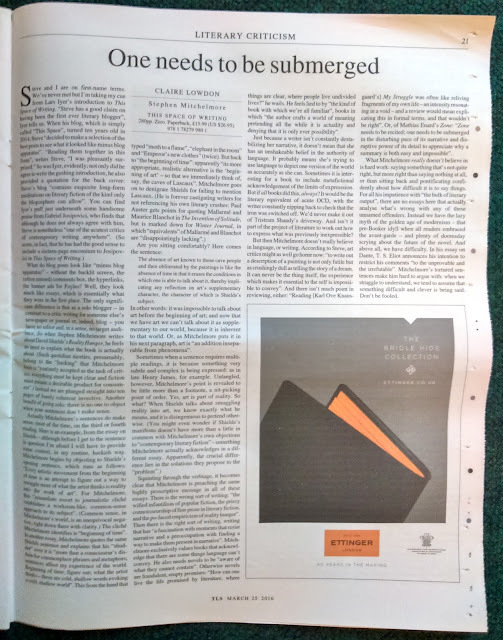 This is a screenshot from page one of Alexander Carnera's review-essay on This Space of Writing in Le Monde Diplomatique's Scandinavian edition, released monthly as a supplement to the Norwegian newspaper Klassekampen. From what I understand it is very positive, with the automated translation of the title – sensitivity for the invisible – indicating the focus, which pleases me greatly. Perhaps what distinguishes little England from the continent is itself indicated in the name of that paper: Class Struggle. What can one expect save haughty disdain from a cruel and cretinous elite seeking only to protect itself from the invisible and instead promote bilgewater as the finest wine? Actually, I expected the Spanish Inquisition. After a few months in which only Being in Lieu reviewed my book, the TLS pooped up with this full-pager by Oxford graduate, Assistant Editor of Areté Magazine and debut novelist Claire Lowdon. It seems appropriate to include these details because her first novel Left of the Bang is described by one review as not so much "a revelation of souls but of CVs". My own reaction has been a combination of disgust and amusement, an ambiguity I value in literature, but I'd prefer to hear more from the outside. 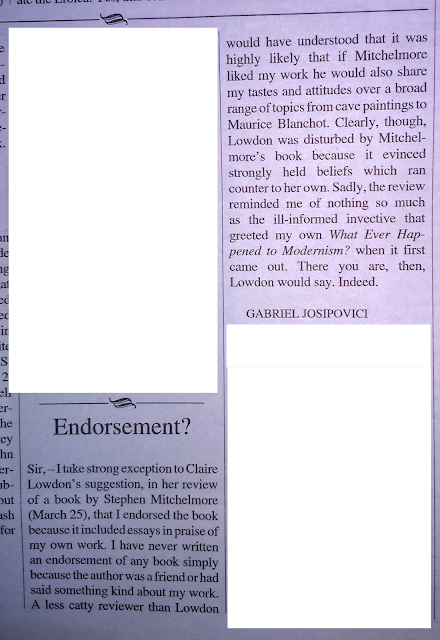 And perhaps you'd be kind enough to buy a copy from Waterstones, Amazon US, Amazon UK, or, least expensively, Wordery. It would be good for my CV soul.